I love my house on the edge of the forest. But If I won a lottery or became a read author, or a fancy pantsy London columnist, oh, what I wouldn’t do with it. I’d gut it and fit real wood flooring: I’d build on a glass extension to my kitchen and fit units to die for; I’d build up the side and have a glass solar on the third floor, so that I could write in the light, all year round.We’d keep the location – I could never be too far away from the iron age fort and the forest – but this great Swedish concrete-built house would transform. We all have I ‘when I win the lottery’ conversations. What would happen if our circumstances changed entirely. But some will go to more lengths than others to make their property dreams come true. In the last days of November, 1978, a man stood in court charged of a house crime of the craziest order. He had, it seems, single-handedly smuggled a villa across a border. Not once, but many times, for there were many pieces of the prefabricated villa. His aim was to avoid the considerable tax duty which would be charged should he declare an entire villa crossing a border. He would have got away with it, too ha it not been for those pesky border officials seeing him so many times they got to know him quite well. The gentleman crossed the border daily over a very long time indeed. The literal lifting of bricks to take them somewhere else feels a gargantuan task, but it’s never too much trouble for a set of light fingers. In 1982 it is fabled, a gentleman by the name of Ray Marinko from Sydney, Australia, returned to his Doubleview house to find an altered state of affairs: just a simple hole in the ground. Nor is London exempt from this idiosyncratic crime: far from it. Let us not forget 10, Jardin Road, South London, which, local folklore claims, disappeared completely from its Thameside location in 1971. And, while it was perfectly within the law, there was the Globe. The trouble all started when the lease expired. Shakespeare’s plays were making a mint. The Globe was a thriving economic concern. But somehow in the melee on the north bank of the city someone inadvertently sold the lease of the theatre to a thespian-hater. Giles Allen was a puritan, and he thought theatre was the Devil. So: he refused to renew the lease and opted to pull the whole thing down. Calamity. The wanton destruction of a gold mine. And where would they find the capital to build a new one? But a loophole in the small print of the lease saved the day. The company was allowed to dismantle the globe, piece by piece, and take it over the bridge to disreputable Southwark to nestle ‘next the bear bating rings. Nothing is permanent: but some things are more permanent than others. One might think a theatre a permanent structure : but it is one of Shakespeare’s poor players who struts and frets his hour upon the stage and then is heard no more. Today the Queen will pass the Globe’s latest incarnation, Sam Wannamaker’s work of genius, as she celebrates her six decade reign. It has elbowed its way to a ringside seat to wish her well. And she will alight at a much older, more permanent structure: the Tower. It’s grey and rainy today. Let us hope Her Royal Highness has brought a brolly. 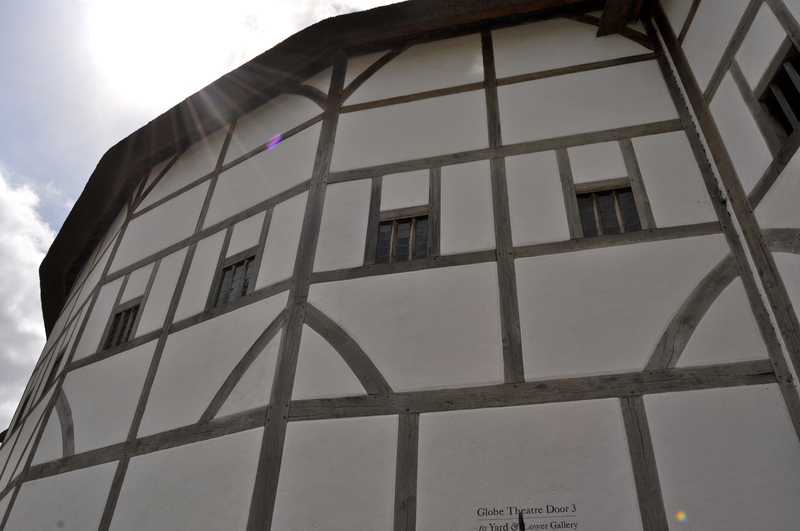 Posted in Quirks of HistoryTagged Giles Allen, House moving, The Globe Theatre, William ShakespeareBookmark the permalink. I agree my lottery fantasy doesn’t have me moving, just improving my home. How nice it would be to have unlimited resources to do so, Sidey! This takes moving house to the next level, Kate! It does seem quite drastic, doesn’t it, Tom? 😀 The mind boggles thinking of all the ramifications, IE! It’s no surprise that moving house is rated amongst the most stressful events in one’s life – but having to carry it as well. Thanks Martin 🙂 No: this weekend has always had precipitation writ large all over it, hasn’t it? This was a fun post, amazing what folks will do with property to keep it to themselves. Hope it’s a fun day with the Jubilee celebration despite the weather. Thanks: where we were it cleared up quite a bit. A good time was had by many. Funny, I would do the opposite. ‘IF’ I won the big jackpot, the first thing to go would be the home. Break that pesty chain around my neck, give me the freedom of movement and travel and to discover. I’d give away everything thus far accumulated, starting over fresh, weighed down with nothing. Home would be where my shoes lay in the morning. Ten years ago I would have felt the same as you. Still, even a gazillion dollars and perfectly inhabitable castles galore does not prevent mother nature from raining on one’s parade -though I doubt your ‘Highness’ will give a second thought. Given her life, she is well aware that every life ‘a little rain must fall’ -never winning the lottery and the elements keeps us humble. Indeed, Hudson: hello 🙂 As you will know by now she stood throughout the majority of the pageant. Wonderful. I know: a lot of work! Relatively speaking, houses get moved around here a lot. Whole museums full of colonial structures which once stood elsewhere. Casually told tales of homes relocated in the face of interstates and whatnot. I confess, in my lottery story I pull up from suburbia and head for the mountains of Vermont or the Maine coast. Some big old farmhouse or similar with a crooked office in which to write. Make sure you tell us when you’re coming to London, won’t you? Sorry that the Queen isn’t celebrating under sunnier skies . . .
Aw, rain schmain. A few drops can’t dampen the spirits, Nancy :-). Although some of us are nursing soggy socks. Good to be happy, just exactly the way you are! Okay. I had to look up brolly. Duh? An umbrella, of course! Loved this, Kate. It is not unusual for significant structures to be moved around hereabouts, either, though none as yet as old as those on your island. We attended a wedding yesterday with a garden reception. What should I find in the most lovely of gardens on a spectacular June evening? An English telephone booth? I tipped my wine glass to the Queen (but, I did not curtsy). I never knew they moved the old Globe across the river. Of course, I love the new one. I will never win the lottery, because I don’t play it. But, I suspect MTM and I would get a small place in a much bigger city, live a more urban life, escape to a small built place on our mountain property when we needed a break, and otherwise travel until we dropped. Town mouse and country mouse, all rolled into one 🙂 Let us hope that windfall arrives and you get those two lovely places. Dear Kate, I hope that you teach writing because your thematic entries into the gist of your posting always take me by the hand and lead me into the forest–and sometimes, thicket–of your subject matter. You are a master essayist. Peace. Gosh,Dee thank you so much: that means a great deal coming from you! Hope you checked out the roving reporter post….I was out yesterday in Hampshire photographing the celebrations in villages and Winchester. Just lovely. And I recorded the party and Winchester bells:I have e mailed it to your gmail address. Oh thank you! I’m still up and reading….Jay is watching the Young Sherlock Holmes and I’m on the computer! LOL! I’ll check my email. Thank you, Kate! The Globe has certainly had its share of trials and tribulations.